We offer a range of talks and practical sessions specifically for secondary age groups. All are detailed below and bookable now. We also have a selection of resources you can use with your group. We offer a range of Talks and Discussions for KS3 and KS4 which are available all year round. • Discussion around What is Art? • Pupils then move to a workshop room to create their own modelled head using plastercine which is then cast in alginate. • Pupils explore the gallery and a particular subject focus. They draw their own subject in black/white. They then transfer this to a lino tile – either real lino or substitute. • Pupils explore the gallery and a particular subject focus. Through drawing their own subject the children create their line drawing print. They then transfer this acetate sheet. 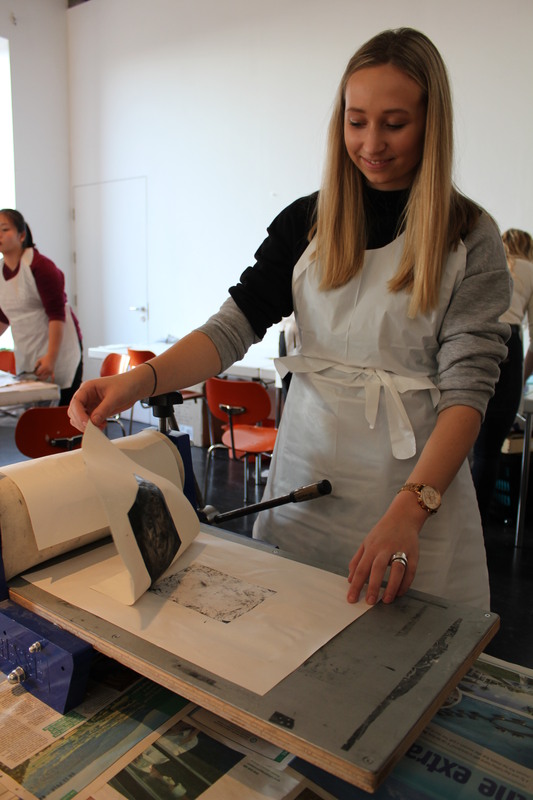 • Pupils then move to a workshop room to mark and print the plate with the press. Pupils explore a variety of alternative drawing exercises including blind contour and ink drawing to build confidence and understand the importance of experimentation.